“Free Trees” the sign said. During this time of year, especially in a bad economy, that sign should be a welcome sight. However, it’s posting on the day before Christmas Eve might not attract too great a crowd. Here in the Pacific Northwest evergreen trees are abundant and around Christmas time Christmas Tree Farms seem to spring up all over. I love the look and smell of fresh evergreen trees and I have lovely childhood memories of many a Christmas where we would set up a fresh tree to decorate with lots of lights, ornaments and tinsel. The smell of pine would scent everyone’s house for many days for back in those days artifical trees were hardly heard of. But…times have since changed and my apartment now has a small artifical tree in the corner and I spray pine air freshner or burn a pine-scented candle to get my fresh pine smell. However, I do get to enjoy Christmas at my daughter’s home where there is always a freshly cut evergreen tree decorated by excited grand-children who are making Christmas memories of their own. My love of evergreen trees would of course lead me to say that they have to be one of God;s wonderful works. As much as I love the beauty of the fall colors and wondrous turning of the leaves in Autumn trees, I would have to say that the evergreen tree is highest on my list of trees and living in Oregon I am glad that the Douglas Fir was designated our state tree in 1939. 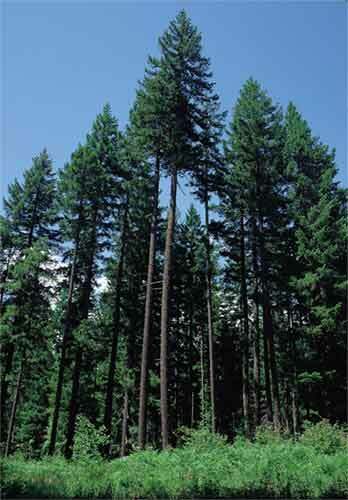 The Douglas-fir was so named in honor of David Douglas, a Scottish botanist visited the Pacific Northwest In 1824. He has been quoted as saying “A forest of these trees is a spectacle too much for one man to see.” He could have been speaking about a forest of evergreen trees, for he introduced several North American native conifers to Europe.and among them was the Douglas-fir which he introduced to Scotland cultivation in 1827. The Douglas-fir is also called Douglas tree or Oregon Pine and nationally,it is one of the most popular for Christmas trees. However, the trees are not just grown for Christmas. They are actually the source of more lumber than any other species of tree in North America. They are prized as one of the most valuable timber trees in the world, for the timber from Douglas firs is said to be stronger than concrete. If you are fortunate to have a sturdy beautiful Douglas-fir as your Christmas tree this year I hope you will take a moment to just sit and look at it. Enjoy it’s green beauty and lovely pine scent. Realize it’s value and give thanks to God for creating such a wonderful tree for us to enjoy. I’ve lived here all my life, and knew Oregon was “God’s Country,” but didn’t know how true it was until I began traveling. Dougs are everywhere, like blackberry brambles. Thank you for spreading the “Keep Oregon Green” motto.